Despite police suspicion of Arab criminal motives, Abbas claims 'settler terror' behind abduction and murder of Arab youth. Palestinian Authority (PA) Chairman Mahmoud Abbas's spokesperson Nabil Abu Rudeineh lost no time blaming Israel for the abduction and murder of the Arab youth found Wednesday morning, even though police are investigating suspicions that the murder was a criminal act by local Arabs. Rudeineh demanded that Israel "expose the criminals and bring them to justice," reports Yedioth Aharonoth. According to the spokesperson, Abbas demands that Prime Minister Binyamin Netanyahu "condemn the abduction of the Arab youth and his murder, like we condemned the abduction and murder of the three settlers." The statement refers to the three Israeli teens who were murdered by Hamas terrorists; Abbas recently signed a unity agreement with Hamas. Last month Abbas did condemn the kidnappings, even while playing victim, saying “those who kidnapped the three teenagers want to destroy us (the PA). We will hold them accountable." Abbas's Fatah movement likewise on Wednesday blamed Israel for "the cold blooded abduction and murder of the Arab youth by settlers." Fatah went on to condemn the murder as a "war crime and organized crime," adding it was "a direct result of the continued incitement by the right-wing occupation (Israeli) government and its complete support for settler terror." While wild unconfirmed reports have claimed the murder was a Jewish revenge killing, police noted all directions of investigation are being looked into, including suspicions that the murder was conducted by Arab residents of Jerusalem. Quoting eye witnesses, IDF Radio said a black car had stopped by an Arab youth in Jerusalem's Beit Hanina who was hitchhiking and he was forced inside. The car then took off. Some time later, the family of the youth, who is understood to be around 16, reported him missing, it said. The burnt body of an Arab youth was later found in the Jeusalem Forest area. There is speculation that the youth is the same one who went missing in Beit Hanina, and the he possibly was murdered by Jews as a possible act of revenge after the kidnapping murder of three Jewish teens. However, there are also reports that the abduction was carried out by Arabs and that the murder was an "honor killing" or another kind of criminal murder. Large police forces are combing the area where the body was discovered and hundreds of Arabs from Shuafat are currently rioting. The road between Beit Hanina and Pisgat Ze'ev has been blocked to traffic. In addition, operation of the Light Rail to Beit Hanina and Shuafat has been suspended, due to concern that rioting Arabs may attack the railway and its passengers. 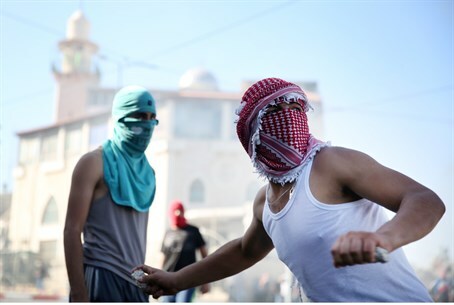 The Arab rioting in Shuafat spread to the Temple Mount on Wednesday, where masked Arab rioters threw rocks at police. This led to the decision to close the Mount to visitors. The entrance into Jerusalem from Highway 443 at the Ben Tzion Interchange was also closed off. Three Light Rail stations were destroyed by rioters. Arab pogromists were also reportedly targeting Jewish homes and cars in Pisgat Ze'ev. Later, it was reported that Arab rioters hurled three pipe bombs at police forces. Only one of these appears to have exploded, and police sappers are neutralizing those that did not. No police were reported hurt by the bombs, although a man was hospitalized from the blast.